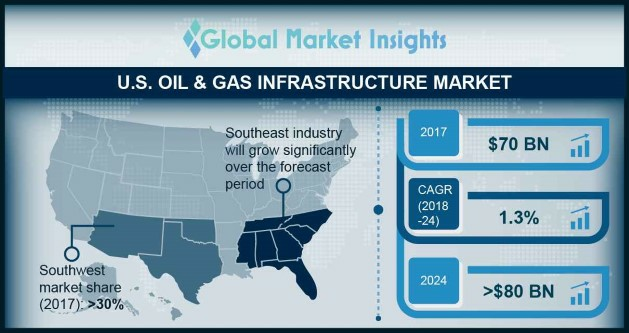 U.S. Oil & Gas Infrastructure Market size is set to exceed USD 80 billion by 2024; as reported in the latest study by Global Market Insights, Inc. Ongoing investments for the expansion of existing refineries along with along with establishment of new units with environmentally friendly footprint will positively influence the U.S. oil & gas infrastructure market growth. Furthermore, rising gasoline demand from Mexico on account of the country’s growing automotive sector has led to planning of new refineries in the nearby regions of the U.S. will complement the industry landscape. The above-mentioned information will be provided for the following regions across the U.S.